Plug n Play! Never lose a Credit Card, POS or ATM transaction again! 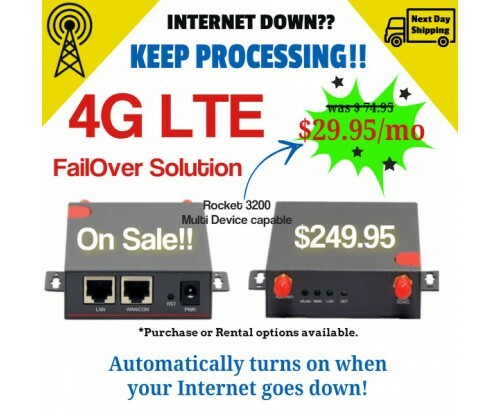 If you're tierd of internet outages causing you to turn away customers then stress no more - the Rocket Wireless 4G solution is for you. Best in its class coverage with all major wireless companies: AT&T, Verizon, Sprint and T-Mobile. WAN port support PPPoE, static IP, DHCP client, 3G/4G. Largest Wireless Coverage in the Nation! Wireless activation is NOT required. Modem comes ready to go - Plug n play out of the box. 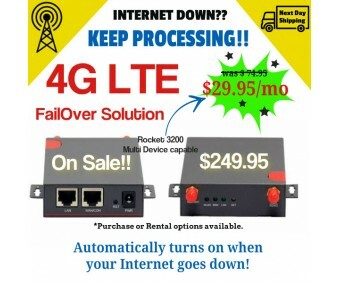 Wireless program is MONTH to MONTH with NO Long Term Contracts. Protocol: ICMP, TCP, UDP, Telnet, SSH, HTTP, HTTPS etc. 2 x Cellular Antenna - Mag Mount. Plug n Play ready!